Does saliva contribute to the condensation in an instrument's bore? Saliva does contribute to the condensation in an instrument's bore. There are, for example, "wet" players and "dry" players. With wet players, the tone holes on their instruments have to be cleaned every year or two to remove the crud that builds up in them. Dry players don't have as much of a problem with build-up in tone holes, but they still need to be cleaned approximately every six years. These lime deposits derive from saliva, not one's breath. I assumed that the only way you can change the pitch of a wood clarinet's tone hole was by moving it closer to or farther from the top of the instrument. Is this true? Not completely. This is the way a manufacturer establishes the basic scale of an instrument. The clarinet can then be fine tuned by fraising (undercutting) and scraping the tone holes to adjust the scale and timbre of the instrument. However, a wooden instrument's scale and timbre can also change as a result of the bore and tone holes shrinking and changing their shape. For example, this is what happens to a clarinet that becomes "blown out". What is the difference between "Repad "and" Good Playing Condition?" I really dislike the term "repad" because it means different things to different people. Many years ago a repad meant a very thorough, complete repair including cleaning, mechanical corrections, and all new pads, corks and felts. I have seen current "repads" where all new pads are used, but no other work is performed. At a minimum, a repad should involve replacing all pads. My definition of a good playing condition involves replacing pads, corks, and felts as necessary, plus any minor damage repair and mechanical corrections. This level of work assumes that the instrument is well maintained. Ideally, a good playing condition should allow the instrument to play well and consistently for one year (until the next annual maintenance is performed). I might add that many instruments are in such poor condition that they need a partial or full mechanical rebuild rather than a good playing condition. What is "blown out" and does it really exist? Since the symptoms of a "blown out" instrument are covered in the question below, lets consider if a "blown out" condition really exists. For people who have always played fine instruments, the concept of a "blown out" instrument may not exist in their reality because they have never directly experienced it. If a person has only played an old, neglected instrument (that may be blown out) and has never experienced playing an instrument in fine condition, he probably doesn't know how well these instruments can really play. If this person were then to play a fine instrument in good condition, he would have established a basis for comparison and he may then realize that his old instrument is in poor condition or "blown out" or whatever. In my reality, I frequently restore instruments that are "blown out". Often, the client doesn't realize how poor the condition of his instrument was until he plays it after it has been restored. The "before and after" experience adds something new to the client's reality. An example "of one's reality based only on experience" comes from a question posed on a clarinet discussion group. The question was, "Do grenadilla instruments really crack"? In essence, one person said, "I've owned many clarinets and none of them ever cracked, so I don't think they do crack". 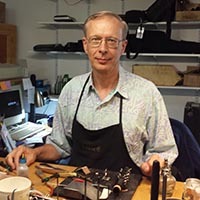 An individual musician may not be in the position to realize how frequently instruments crack or become "blown out", but a skilled technician should. What are the symptoms of "blown out" and how can I test an instrument before I buy it? An instrument's performance may change in many ways over time and any one change can indicate the beginnings of a "blown out" condition. Some parameters that indicate a blown out condition include tuning pitch, uneven scale, unresponsiveness, and a dead timbre. Musicians owe it to themselves to experience playing a world class instrument in fine playing condition. Once this is accomplished, the player is in a better position to judge the merits of other instruments. This question is addressed extensively in the article, Grenadilla Wood, Environmental Effects, and Organic Bore Oil on the Academic link on the left. Why would I wish to buy a barrel other than the one which came with my instrument? Assume that you have an instrument and mouthpiece that you really like, but you wish to change one or more performance parameters, as, for example, you may want a darker timbre or a more focused sound. You may be able to reach your goals by changing only the barrel. 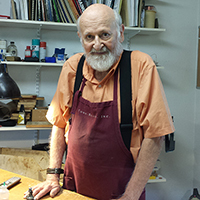 You can make the process easier by contacting a custom barrel and mouthpiece maker like Clark Fobes. Is there a difference in "professional" brands, in that one would be better for "chamber", "orchestra", "jazz", popular gigs, solos? The answer to this question depends upon the value judgments of the player. I don't think that there is any one brand of instrument that is "best" in a particular venue. Most of the fine players with whom I've worked can use the same equipment to perform in all venues. Ideally, a person may be able to modify only his reeds to change the instrument's timbre in order to match the playing situation. Some people change mouthpieces to accomplish timbre changes, but the player can also get into trouble doing this. For example, I occasionally have a client that buys and uses so many different mouthpieces that he never really learns how to get the most out of any one of them. Why do some clarinets "blow easy?" and what does this have to do with "tone?" Assuming good mechanical playing condition, the only clarinets I've played that didn't eventually "blow easy" were poorly designed and manufactured minor brands. If a major brand clarinet plays stuffy, then something has gone wrong with it. Everything should be checked including embouchure, reeds, mouthpiece, and barrel. A clarinet that plays stuffy would have a compromised "voice" while an "easy blowing" clarinet should have a clear "voice". I have received many clarinets for an immersion rebuild that were already in good playing condition mechanically, but their playing qualities had deteriorated. Because they were in playable condition, I was able to play and evaluate them before the immersion rebuild. These instruments played poorly because they were "blown out"; their "voice" was compromised. Some were "stuffy" while others had a dull timbre and uneven scales. According to the owners, the clarinets recovered their original "voice" after being immersion processed. Why are my clarinet keys black (or rusting)? I bought my own clarinet a year and a half ago and the keys look like they are rusting but the clarinet wasn't used, it was brand new. Is there any particular reason why this is occurring and if so how can I prevent it? The keys on your clarinet are made of nickel silver. The finish on the keys is nickel silver, nickel plate, or silver plate. All of these metal surfaces are subject to tarnishing (oxidation). Silver will develop an almost black patina, especially on portions of the keys that are not touched. The other two metals will develop oxides that are dull silver in color. Pollutants in the air, such as sulfur oxides, will cause tarnishing. Acids from your hands will also cause tarnishing. You can slow down tarnishing from air pollutants by putting treated 3M strips in the instrument case. These strips will absorb sulfur oxides from the air in the case. Tarnish caused by hand acids can be minimized by wiping the keys with a cotton handkerchief after playing. An even better cloth for wipe-downs is a Selvyt cloth. Also, if your hand acids are strong, your keys will tarnish even more quickly. You might consider thoroughly washing your hands before you play your instrument. Both the 3M strips and the Selvyt cloth are found under Products on my web page. Were the keys tarnished when you bought the clarinet or has the tarnishing occurred since then? Sometimes strange things can cause tarnishing. For example, I had a customer that brought me a flute that they had purchased new six months previously. The flute (silver plated) was black and they didn't know why this had happened. I asked them questions for 15 minutes or so only to find out that the flute was kept in the back seat of their car every afternoon. I suggested that they have the catalytic converter in their car's exhaust system checked for leaks. They later told me that exhaust was indeed leaking into the cab of the car. The strong sulfur oxides in the exhaust gas caused the silver plated flute to quickly turn black. In this case, the flute in the car acted like a canary in a mine shaft; both could indicate bad air. Why should I "oil" my woodwind? How often? If you value your instrument and wish to keep it in good condition for as long as possible, I suggest that you use my organic bore oil to stabilize the wood and protect the bore from saliva damage. Ultimately, the frequency of oiling is determined by the rate of absorption by the wood. Initially, an instrument may absorb a noticeable amount of organic bore oil. If the instrument is to be hand oiled only, one could oil several times in the first week or two. Eventually, the instrument should be oiled once every four to six weeks depending on many factors including, for example, relative humidity, hours of use per week, and the quality of the player's saliva. Since there are many things a musician should know before starting an oiling routine, I provide a detailed handout covering oiling procedures with the return of an immersion processed instrument and with orders for organic bore oil. Using organic oil is necessary for the good health of the instrument, but equally important is knowing how to apply the oil safely and how to determine the frequency of oiling. What is the difference between "bore oil" and "organic-based" bore oil? The difference is huge. The words "bore oil" identify anything that one might put in the bore of their instrument. However, the words do not identify the type of oil in use. Virtually all brands of bore oil sold in music stores are petroleum or synthetic based. These oils are not absorbed by wood and they do not interact with wood fibers. The organic oil I use and sell is absorbed by the wood and it does interact with wood fibers. Please refer to the articles on my Academic page for a more detailed explanation. Where can I get "organic-based" bore oil? It is available right here in our store!